this weekend friends from out of town were visiting cleveland. my friends used to live in cleveland and the family's favorite cleveland restuarant is #1 pho. I think most of us experience an almost instinctual drive to eat at our favorite restaurants when visiting a place where we used to live. friday night I was fortunate to join my friends when they made their pilgrimage to #1 pho (I also love #1 pho). along with the visiting family, the group consisted of lil b and his parents, and ms t and her mama. 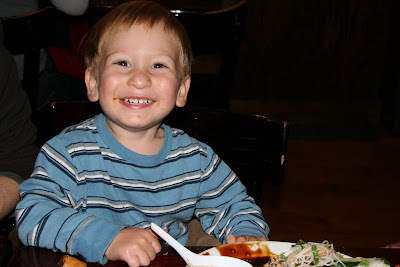 along with having excellent food, #1 pho is also very family friendly. the thought of four kids between the ages of two and five going out to dinner could indicate disaster. but these kids were well behaved and they loved the food. 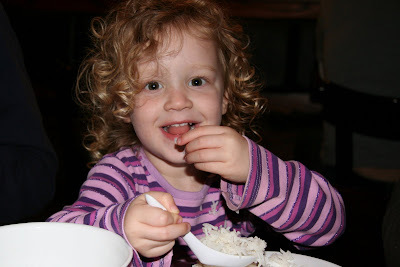 sweetpea loves rice she finds a spoonand hands are much more efficient than chopsticks! 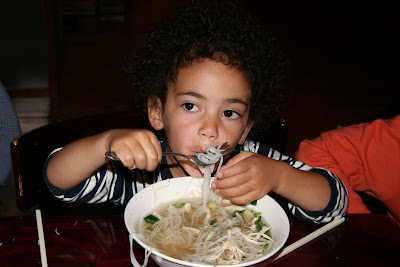 "p" sees how much pho he can phit in his mouth! 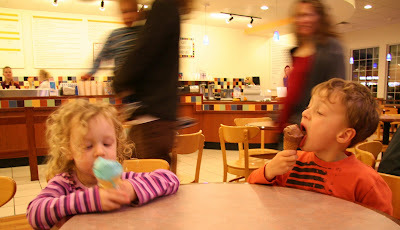 after dinner at we all went on another yummy pilgrimage - this time out for some mitchell's ice cream. which you might recall is the best ice cream in cleveland, if not the universe! y is also for youngsters! since sweetpea and "p" and their parents were visiting, ms. t's parents threw a party so all their cleveland friends could visit. f snapped the photo above capturing me hanging with a few of the young ones who were attending the party. 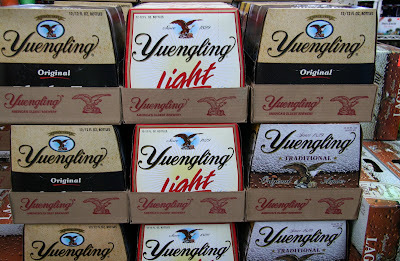 y is also for yuengling - the oldest continuously operating brewery in the united states. 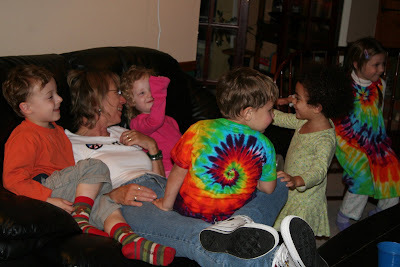 There is something about being piled on by a gaggle of kids. Great pix. Today, I had star stickers on my face from hanging with my 4 year old friend. Aww, they're all so cute! Very nice. Made me hungry! We have a restaurant called Pho in our area too, and we go to it whenever we dine out, which isn't often. We take people there when they visit. 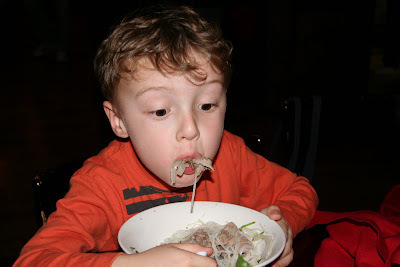 ""p" sees how much pho he can phit in his mouth!" -I LOVED that line. Great pix of the kids and you. My cousin used to clean the Yeunglings' house! I agree about the restaurant thing - one just must go! And I agree with Sweetpea - chopsticks are a challenge. Glad to see there are some decent places to go. Hope we make it soon. great photos! Kids keep you Youthful! I finger painted with some little ones today, and if that wasn't messy enough, a big charity bakesale is in my (near) future. Y is also for youngsters! Oh, those photos make me want to foster a child as well as a basenji. what a great bunch of kids! Would have loved to be at the pho place slurping along with the lot of them! You look like you're in a great space in that shot. The energy must have been bouncing off the walls. Such cute kids! It sounds like a great weekend visit. And the food looked so Yummy it made me hungry!